Prince George, B.C. – Two males are in custody, suspected of breaking and entering a number of rural properties west of Prince George. 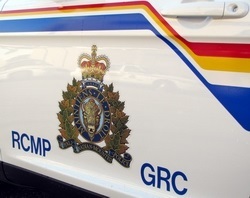 RCMP in Prince George say they have received a number of reports since August 11th of break and enters to properties west of Prince George, including Norman Lake. Just before 11:30 last night, an RCMP member was returning from investigating one of these Break-ins when he observed a suspicious vehicle traveling on Norman Lake Road. The vehicle was a cube van from a rental company . The officer activated the emergency equipment and initiated a traffic stop with the van. According to police, the driver of the van failed to stop for police and headed back towards Highway 16. Once the van reached Highway 16, the driver turned east towards Prince George and then turned north bound on Telachick Road. At approximately 11:40 PM, a spike belt was utilized to stop the vehicle. The two male occupants fled the van on foot. Ammunition was found in the cab of the van leading officers to believe the suspects may be armed. No other occupants were found in the van. A Police Dog Service Team attended the scene and began tracking the suspects through a dark wooded area. Approximately 10 minutes later, officers began to feel the effects of bear mace in the area. Several minutes later, the officers located and arrested both suspects. Both 30 year old males will be held in custody pending further investigation. Several charges are likely.More information to be released as the investigation progresses. To report a Break & Enter or theft of property that has previously occurred, call the Prince George RCMP’s non-emergency line at 250-561-3300. Every single thief is a scumbag. Hey Dumb and Dumber, you really thunk you was gonna get away? Red will look good on yuh! Great police work. Now if we can get the judges to clean up their acts, years of free lawyers for the criminals have not done society any favors. The courts will demand they get hugs, money and CNN will make them look like the victims. That dog service team deserves some rib eye steaks for lunch!